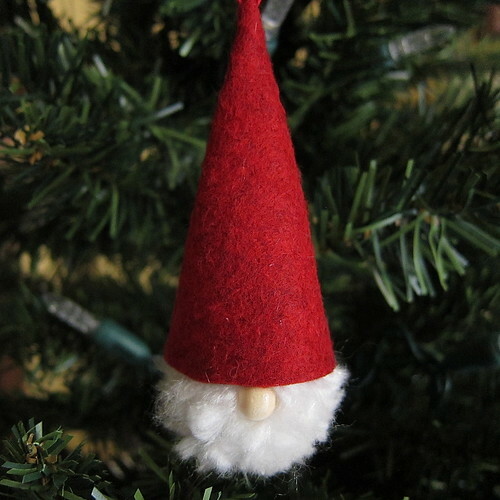 Often on Scandinavian Christmas ornaments Santa or tomtes are shown as just a beard, nose and large hat. This week’s ornament is based on that look. This ornament is so easy, you could whip out a bunch of them for gifts or to decorate packages in an afternoon. 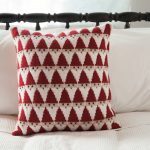 Kids love to make pom poms, so this would be a fun one to do with them too. 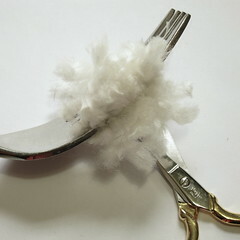 I used a dinner fork to make the smaller sized pom pom, so no special pom pom making tools are needed. 1. 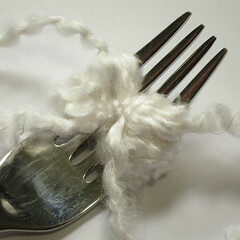 Make the pom pom – Wrap the yarn around the fork 25 times and cut off the ball. Cut another piece of yarn about 10 inches long and put on the tapestry needle. 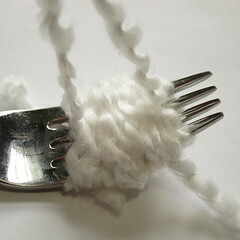 Thread through the center of the wrapped yarn between the 2nd and 3rd prongs. 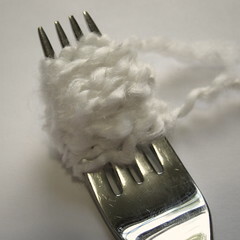 Wrap the ends of the yarn around so both sides of the yarn on the fork are wrapped in it. Tie into a tight knot. 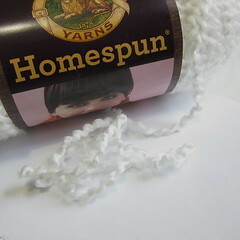 Cut the wrapped yarn off at both sides. Roll in your hand to fluff out. Trim to even out the edges (I needed quite a bit of trimming. 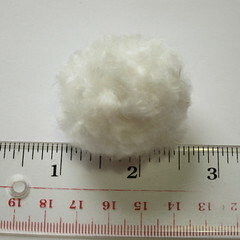 Your final pom pom will be about 1 – 1 1/2 inches. 2. 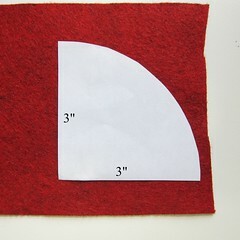 Make the hat – Set your compass to 3 inches and draw a half circle on a piece of paper. Cut that half circle in half. You’ll have a quarter circle with two 3 inch sides. 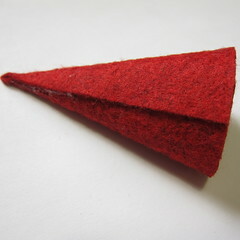 Use that pattern to cut out the felt. 3. 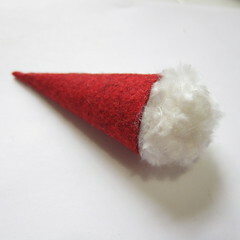 Put a bead of glue on the inside of the bottom of the hat and insert the pom pom. 4. 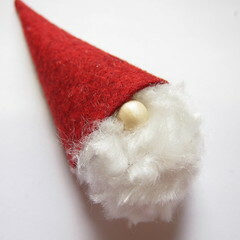 Put a dot of glue on the wooden bead and nestle into the pom pom just below the hat. If your bead has a hole through it like mine did, turn it so the holes are on the sides. 5. 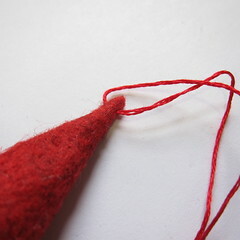 Thread some embroidery floss on a sewing needle. Stitch through the top of the hat. 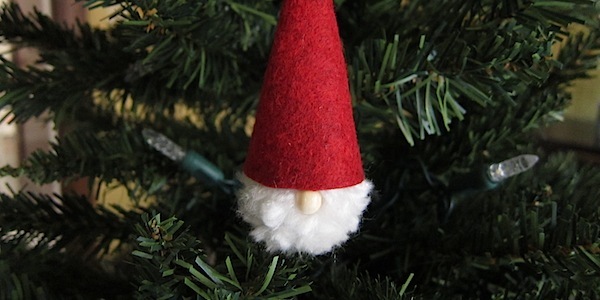 Tie into a loop for hanging the ornament. Now I’m torn to whether these or the little snow people should decorate my presents this year. 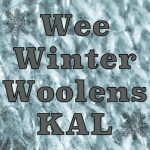 7 years ago by Kat in Advent Calendar Project , Christmas , Craft Projects , Crafting with Kids , Crafts , Holiday , Projects | You can follow any responses to this entry through the RSS feed. You can leave a response, or trackback from your own site. Cute! If you’re short on time, you could use purchased pom poms. They would make a cute lapel pin as well. Just attach a pin to the back of the hat.